We love food. Most people, if not all, love food. Which is why the advancement of technology does not neglect the food and cook industry. Right now, one of the newest trends for cooking equipment is the electric griddler. A griddler incorporates multiple cooking tools into one compact device. Typically, a griddler can function to handle multiple cooking needs such as for making waffles, sandwiches, Panini, and even steaks. Cuisinart’s models have captured lots of attention lately. Cuisinart GR 4N is especially very popular because it has five built-in functions already yet is sold at a very affordable price point. One step higher on the ladder, there is Cuisinart GR 150. Which one should you choose? Cuisinart GR 4N or Cuisinart GR 150? In general, both Cuisinart GR 4N and Cuisinart GR 150 are very compact and lightweight. For sure, you can easily put them in your kitchen. They are also quite portable. Between the two, Cuisinart GR 150 is a little bit larger than Cuisinart GR 4N. This is because of two reasons. First, Cuisinart GR 150 indeed has a wider cooking space. Second, Cuisinart GR 150 features more built-in functions than Cuisinart GR 4N. Regarding the cooking space, Cuisinart GR 4N only has 200 sq in total area whereas Cuisinart GR 150 offers some extra space with 240 sq in total area. Both models have brushed stainless steel exterior which is very solid and sturdy, performing a flawless job in protecting the internal cooking layers and components. Besides coming with a bigger body, Cuisinart GR 150 also packs more power. Cuisinart GR 4N is actually a great product, featuring five cooking options and nice heating power. 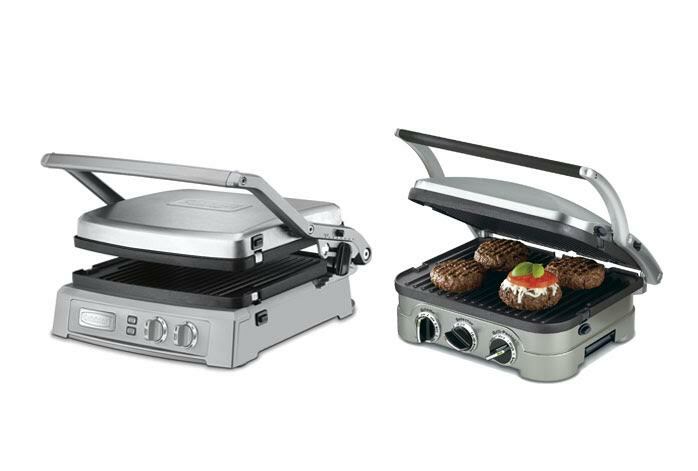 Cuisinart GR 4N can act as a full grill, contact grill, panini press, full griddle, or half griddle. It is 1500-Watt, and is able to produce 450-degree maximum temperature. On the other hand, Cuisinart GR 150 comes with six functions. In addition to the five mentioned previously, it also has the top melt functionality. It is 1800-Watt, able to heat up to 500-degree maximum temperature. The dual-zone temperature control ensures consistent and accurate heat levels throughout usage. It also has an integrated drip tray that keeps things neat without any mess. Considering that the price gap between the two products isn’t that much, we recommend you to choose Cuisinart GR 150. It has more functions and is able to heat to higher temperatures. The larger cooking surface is also always handy.